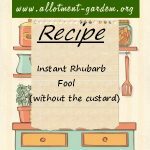 Recipe for Instant Rhubarb Fool (without the custard). Set in the fridge for half an hour and decorate with more fruit as desired before serving. 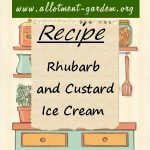 Recipe for Rhubarb and Custard Ice Cream. Remember those lovely childhood sweets? This ice cream uses the combination in a new guise. Recipe for Rhubarb Snow. 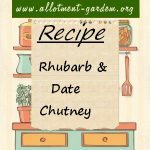 This dessert recipe is the perfect recipe for the springtime season of rhubarb when it is nice and tender. Serves 4 to 5. Recipe for Rhubarb Mousse. A very easy to make sweet-tart creamy dessert that is eaten chilled. Traditional standard recipe for Rhubarb Crumble. Serve with custard, cream or ice-cream. Enough for 4 people. Recipe for Rhubarb Marmalade. 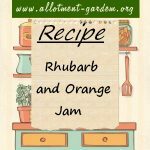 The set isn't quite the same as a conventional marmalade but it's delicious anyway. A very unusual marmalade. Recipe for Rhubarb Cake. Rhubarb cake sounds absolutely wonderful! Straight forward to make as well. 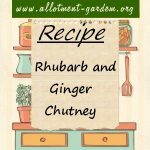 Serve with a dollop of double cream!! Recipe for Rhubarb Jam. You'll need to use jam sugar for this (or ordinary sugar with added liquid or powdered pectin) as rhubarb has next to none!